I don't think I've come across a Wes Anderson movie that I haven't genuinely liked before and Moonrise Kingdom is no exception. Set in September of 1965 on an island called New Penzance off of the New England Coast, an orphan by the name of Sam Shakusky(Jared Gilman)is attending a Khaki Scout Summer Camp lead by Scoutmaster Ward (Edward Norton). Suzy Bishop(Kara Hayward) another 12 year old that lives on the island with her parents Walt (Bill Murray) and Laura (Frances McDormand) along with her three younger brothers. She and Sam who are both outsiders and somewhat introverted met the previous year during a church performance of a play about Noah's Flood and have been pen pals ever since. As they write, their feelings for each other grow and so, at the start of the movie, they decided to run away together. So Sam breaks out of his scout tent and Suzy runs away from home and they meet up and they hike off into the wilderness on the island with the goal of reaching a secluded cove where they can stay and live. Of course, by the time they get going both Scoutmaster Ward and Walt and Laura become aware that their respective children are gone and alert the authorities- name Captain Duffy Sharp of the Island Police (Bruce Willis). The hunt for the two children begins and a group of Khaki Scouts catches up with Sam and Suzy in the woods- in the attempted capture, Suzy stabs a Khaki scout with some scissors and the Scout Camp's dog is shot and killed with an arrow. The scouts flee and Sam and Suzy reach the cove- which they name Moonrise Kingdom, get romantic, kiss and make out a little bit. Eventually the parents, scoutmaster and the police find them. Suzy's parents take her home and Sharp contacts Sam's foster parents who say they don't want him back, so they have to contact a woman by the name of Social Services (Tilda Swinton) who says Sam will have to go to a juvenile refuge and potentially have electroshock therapy. Sam's fellow scout's decide to help Sam and Suzy after a change of heart and spring them and paddle to the nearby island of St. Jack Wood to seek out the help of an older scout by the name of Cousin Ben. He thinks getting Sam a berth aboard a crabbing boat is the answer, but Sam insists on getting married in a totally non-binding and not at all legal ceremony to Suzy. Of course- once again, the parents and police are looking for them- even more urgently now because of an incoming hurricane. And after a few more twists and turns everyone finds themselves back at the Church where Sam and Suzy first met and it is Captain Sharp who steps up and offers to be a foster parent for Sam so he can stay on the island and maintain contact with Suzy. I was honestly a bit 'meh' about this movie while I was watching it, but by the end I think I was fully onboard. Yes, Anderson dabbles in the same whimsical, eccentric world building that marks all of his movies- so a viewer can be forgiven if they're left with the feeling that they've seen variations on this before. Despite that, Anderson can create charming and transporting worlds and Moonrise Kingdom is no exception. While I think this is meant to be more of a 'coming of age/love story' I was reminded more of books like Swallows & Amazons and pretty much anything by Enid Blyton- you know those adventure type stories for young people? Here's the thing though: I want to see Anderson do something outside his comfort zone. Like I was seriously wonder while watching this what it would be like if he directed the next Alien movie. He has such an attention to detail and can create incredible worlds, but I feel like a left turn down crazy lane might do him some good. That's not to say he can't and shouldn't keep doing what he's doing- if there's one thing a Wes Anderson movie makes you want to do, it's go and watch like every other Wes Anderson movie you can- which is precisely what you'd want the audience to feel, really- always leave them wanting more. 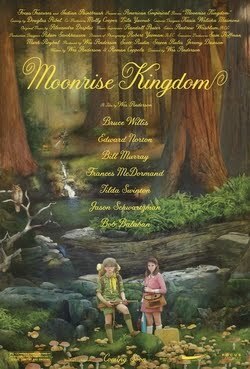 Overall: Charming whimsical and enjoyable- Wes Anderson does it again with Moonrise Kingdom. I'm going to go with *** out of ****.